Appian Way leading from outskirts of Rome to regional park. My earlier post about the holy month where we currently live got me thinking of my own favorite time of year: Christmas! And though I am not Catholic, I especially love the way Catholics celebrate Christmas until Epiphany, January 6. Because otherwise, it’s kind of a bummer, right? There’s all this to-do leading up to the One Big Day, and then, as soon as you sacrifice a tree and rip open all those presents come Christmas morning, you’re only left to console yourself with the emptiness of materialism and debauchery of over-eating with perhaps a trip to your local church where you pretend to acknowledge what Christmas is really about. Nope, the Catholics have got it down: celebrate Christmas every day for twelve days straight! And what better place in the world to do that, than in Rome? 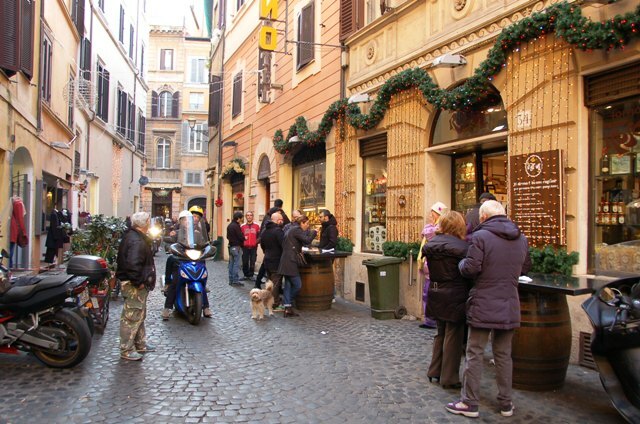 Rome during Christmas holidays outside pensione where we stayed. Sam and I were lucky enough to have a layover there this past Christmas holiday, and while we weren’t in Rome for all twelve days, we were there for Epiphany, which was amazing. Sam, waiting in line for Vatican Museum (the Sistine Chapel is inside the museum). We did all the usual tourist stuff: eat pasta and gelato, drink wine, pose by every fountain we recognized from Art History classes of yore, watch pick-pocket gangs work the public bus system, stand in line four-and-a-half hours for entrance to the Sistine Chapel where we were continuously harangued by sneering priests with scary voices NOT TO TAKE PHOTOS, even though … we weren’t! 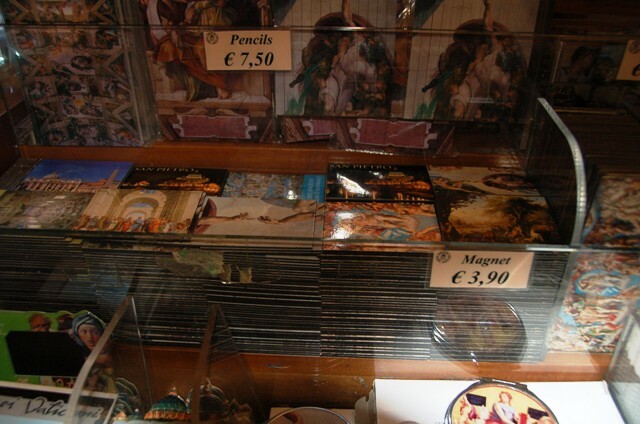 (But hey, those priests make sure you can buy all sorts of stuff exploiting Michelangelo’s work in their nifty gift shop one must walk through to exit said chapel) …. 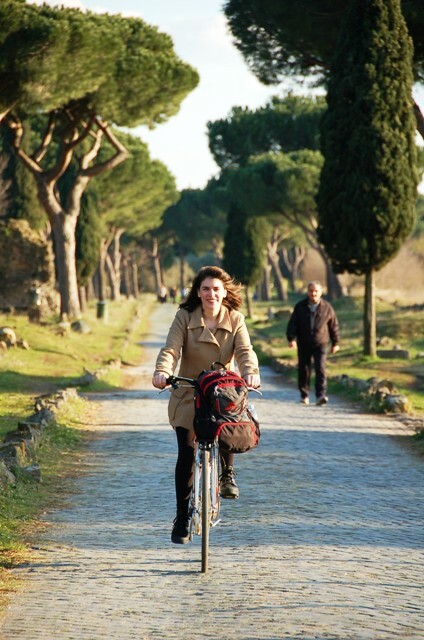 But the one thing we did in Rome that stood head and shoulders above the rest was … cycling the Appian Way! View of Appian Way with ancient tombs, towers and cisterns. You can walk around them and read up on their significance using the free map handed out at the Info Point office. Despite the mind-boggling fact that the Appian Way is now 2327 years old, parts of the road’s original pavers still seal the soil while other stretches have been renovated with newer stonework. Along the 10-mile portion now conserved as a regional park, verdant countryside filled with mewing sheep, pretty little swaths of forest and crumbling castles and catacombs pepper the landscape with unbelievably photogenic scenery. This is also where two of Rome’s famous Christian Catacombs, San Sebastiano and San Callisto, offer hour-long underground tours where (“NO PHOTOS!”) one can gawk at the underground, graveyard labyrinths snaking miles long and deep into the earth, evidencing thousands of low-wealth Christians who were buried in tiny, stone tombs here back in the day. Sam on road to San Callisto Catacombs. 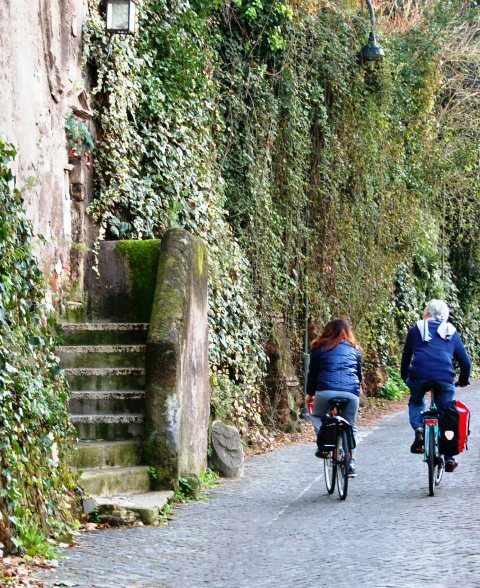 In fact, many people come to the Appian Way just to visit the catacombs, and while I’m glad we took a tour of one (we went to San Callisto), the cycling part is still my favorite memory of our time there. Ok, take the product! 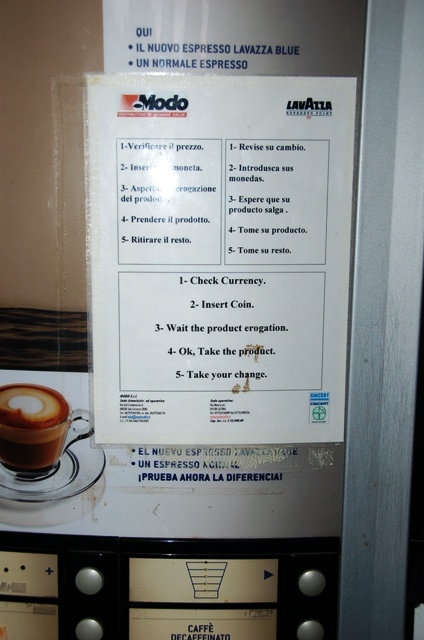 But we found this vending machine sign (just outside San Callisto entrance) well worth the trip alone! 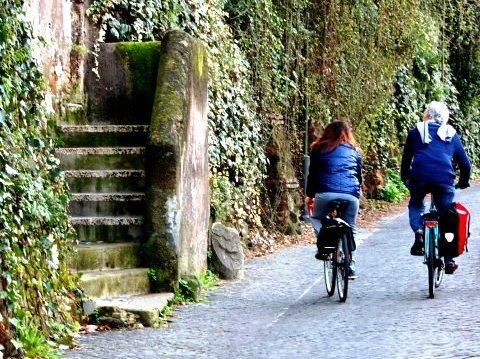 Depending on where you are staying in Rome, the Appian Way is within walking distance, though it can be confusing to reach, thus resulting in quite a time commitment. Public buses are a quicker option for those on a budget like us, and then of course there are the gazillion tour companies you can sign up for if that’s more your thing. For us, we’re do-it-yourself-ers, so despite the fact that it would have been far more economical on the time scale of things to be good little tourists and just buy those tour tickets, we … didn’t. As a result, we killed one whole afternoon walking the two-hour journey there, only to find the Christian catacombs would be closing too soon to fit in a tour, and any rental bikes would need to be returned within an hour, which hardly made the attempt worth it. So, we skulked back to Rome and ate our sorrows away with a pizza. Passing through Porta San Sebastiano on our walk to Appian Way. Not to be defeated, the second day, we clutched our wallets with death grips and took the 118 bus, which stops right before the friendly Info Point Appia Antica where both catacomb tour tickets and bike rentals can be purchased. This time, we arrived around one o’clock in the afternoon, which left plenty of time to fit in a bike trip down the 10-mile stretch of road and back, and fit in a catacomb tour before closing time. Eureka! 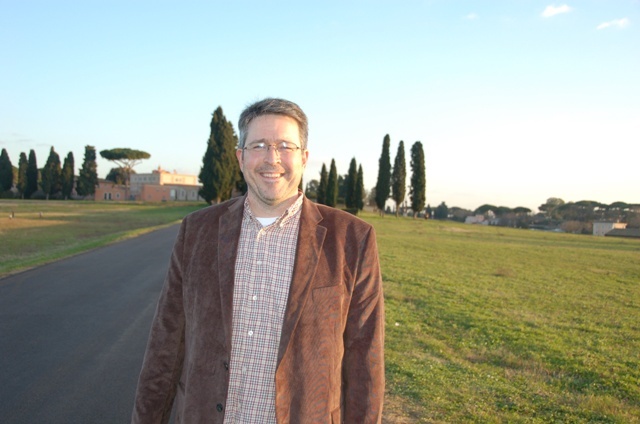 Me, on the Appian Way! 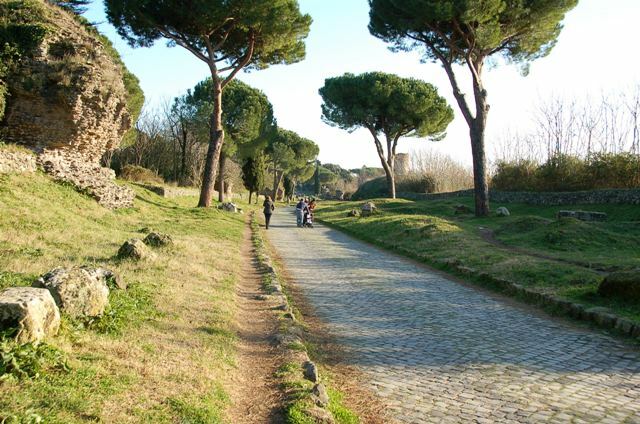 The Appian Way park lies about 3.6 miles (6 kilometers) southeast of Rome’s city center. Public bus 118 goes directly from downtown to a bus stop before the park’s Info Point Appia Antica visitor’s center, where catacomb tour tickets and bike rentals can be obtained. Park hours vary upon season, but generally run from 9:30 am to 5:30 pm (6:30 on Saturdays and Sundays during summer). Caveat: when we went in early January, even though the park is said to stay open until 5:30, the last catacomb tour was around 4 and the Info Point where one rents bicycles was to close shortly thereafter. Bike rental is 3 Euro an hour or 15 Euro for the day. 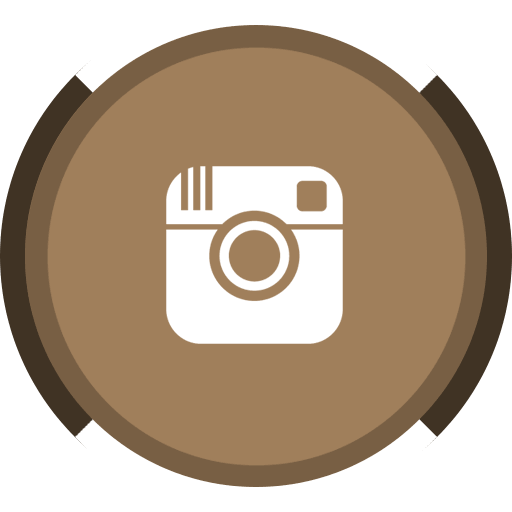 Since the park is only 10 miles in length, you don’t really need more than a couple hours for a leisurely ride with photo stops, unless you plan on making tour stops along the way to various other sights and catacombs. Catacomb tours vary in cost, but St. Callisto, where we went, was 8 Euro a person. Be sure to check the tour schedules ahead of time as certain catacombs are closed for certain holidays or days of the week. 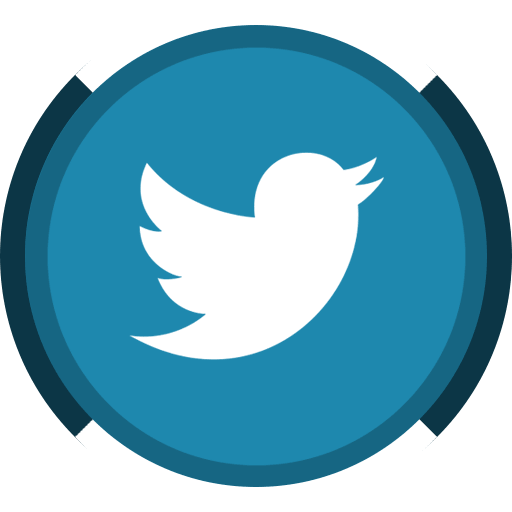 For example, St. Callisto is closed on Mondays and during the month of February. 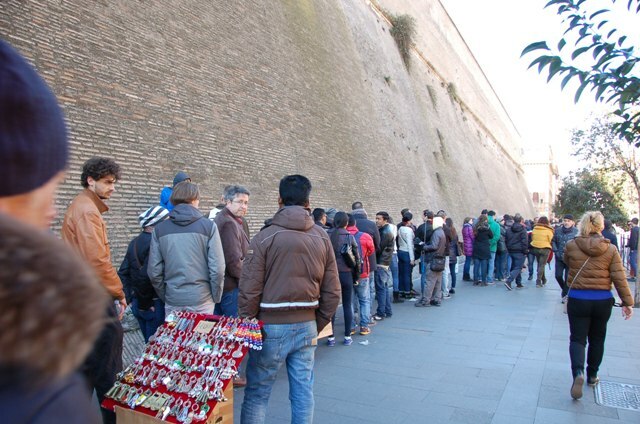 WARNING: Beware of tour operators (or even hotel front desk clerks) who tell you that sights are closed because of a holiday. They may be in fact correct, but get a second opinion. In our case, we were told that the park was only open for paid tours because of Epiphany, but this turned out not to be true. 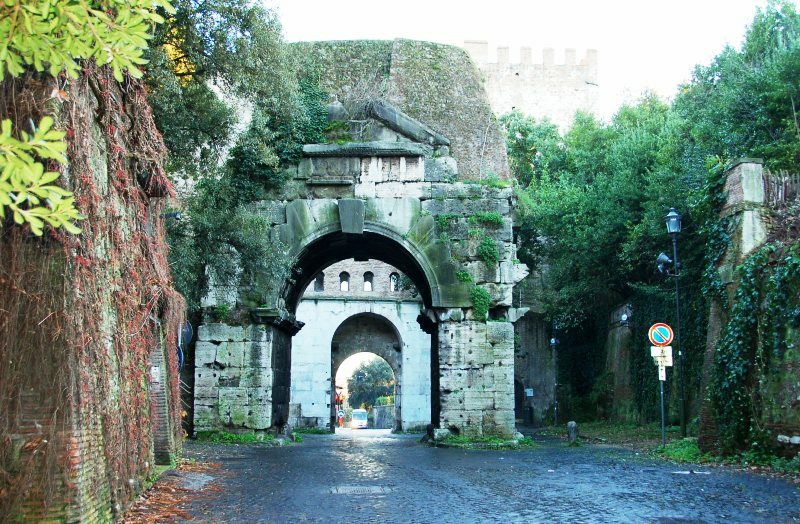 There are a few restaurants at the beginning of the Appian Way should you wish to stop for refreshments. Get the map! As mentioned earlier, the Info Point has a great free map (available in several languages) that highlights the various ruins and provides a bit of history. Such beautiful pictures!! I really like the individual ones of each of you. Jesse looks gorgeous, as usual, and like a postcard picture! Thanks, Suzanne. :) Sam gets credit for that last photo! And it really did look like a postcard; everything along the Appian Way park was so gorgeous — it almost looked fake! Wow, what a beautiful place. A bike ride doesn’t get much better than that, I’d say. Glad you’re getting to see so many wonderful things!